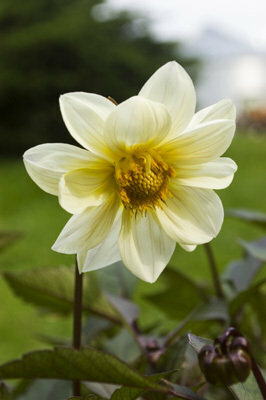 I hate to admit that I completely forgot about my dahlia tubers until early July of this summer. They were stored in the cold room in the basement and, by that time, the new shoots had pushed the taped lids of their cardboard boxes open. 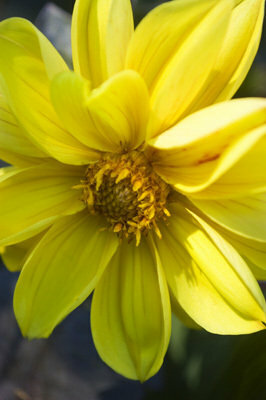 Usually, however, even dahlias that are planted right after the last spring frost here in Zone 5 don't have time to do much blooming before the first autumn frost. Although I didn't have much hope for flowers this year, I planted 'Kaiser Wilhelm' and 'Sonic Boom' anyway, but not at six inches deep, as I usually do. Instead, I positioned them just below the soil's surface with their shoots protruding above it, to give them a head start. 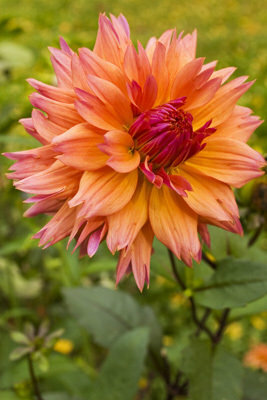 When I was in Wal-Mart a couple days later, I saw scads of other dahlia tubers marked down to about a dollar per bag. Those of you who have read my previous articles know that marked-down plants have the same effect on me as sad-eyed puppies at the pound do. Most of them were trying to grow inside the bags, which seemed especially pitiful. So I had one of those conversations with myself. "Come on, Audrey, you know that dahlias need all the time they can get to do well here, and summer is virtually a third over already." "Yes, " I reminded myself, "but this could be my chance to find out whether my theory is true." I've always believed, after all, that dahlias aren't really slow growing. They just prefer cool temperatures and wet conditions, so they sulk until fall gives them the weather they like. I could call the whole thing an experiment, I told myself virtuously. Naturally, I came home with a bunch of bags, including a collection of dinner-plate dahlias and a collection of red-leaved types, as well as individual varieties. I planted their tubers just below the soil surface also, wherever there was still room for them. Those sites included an empty semicircle in front of some rosebushes, bare spaces where sunflower seeds hadn't come up in the vegetable garden, etc. Fortunately our summer was mostly wet and not extremely hot, except for an exceptional week or two. So the dahlias didn't have to sulk too frequently. 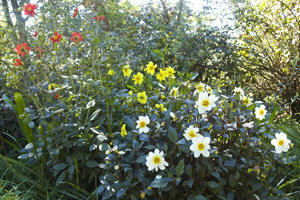 The one in the thumbnail and to the left here, 'Zingaro', bloomed first at the end of July. Most of the others didn't start performing until mid August or later. 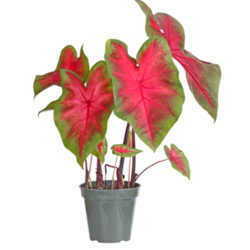 Although the red-leafed 'Jewel' mix had gorgeous foliage, its flowers were on the simple side, with only single or semi-double flowers. 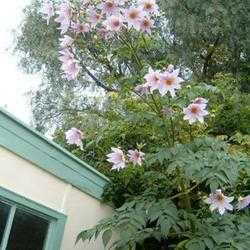 However, they actually looked more natural in the landscape than dinner plate dahlias do. The only dinner plate type to bloom yet (by mid-September) apparently got chewed up by a slug or other pest before it opened, as it had brown spots all over its shaggy yellow face. 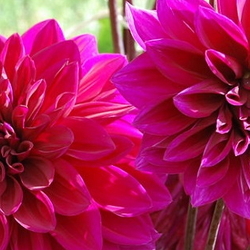 The two older dahlias began blooming around the beginning of September, just about the same time that they did last year. 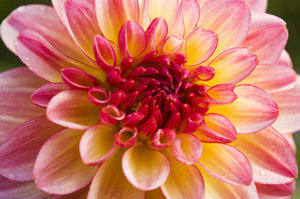 So what did I learn from the Great Dahlia Experiment? Well, I've concluded that there are some dahlias, such as the red-leafed types and 'Zingaro', which don't wait until fall to bloom. It could be that the later ones are day-length sensitive, and only begin flowering when the daylight hours decrease to a particular point. The older dahlias, after all, did stick to the same schedule, despite being planted a month later than usual and having more water this year than last. So I at least proved that my absent-minded delay in setting them out didn't affect their performance all that much. I've also concluded--to my great satisfaction--that marked-down dahlias are worth taking a chance on! At the moment our extended forecast isn't calling for freezing temperatures until the end of October. If that holds true, more of the plants might get a chance to strut their stuff. This experiment worked so well that I've been thinking, What if I leave a few tubers in the ground to see if they might possibly survive the winter there? After all, a lot of my callas do. Granted, they seldom bloom, but they do survive! Of course, if the dahlias begin making big puppy eyes at me again, I might not be tough-minded enough to leave them out all winter. Or I could be like the adoptive mother who tells them it's for their own good, after all. " Think how much sooner you could get up in the spring, if you were already out there" or "Show a little gratitude! You'd be in a dumpster somewhere, if it weren't for me!" Photos: The photos in this article are my own.